My big boy toys - The Home Machinist! Lot´s more ideas for builds, want to make a steam powerd mobillity scooter, looking for plans of a 1,5 HP engine. Crazy good time. Thanks for sharing. PS: Watch out for those trees! I have seen the big wheel thing before. But i dont know how you steer it, or see around the thing. Pretty impractical. Now the scooter is something else, and like a barstool racer, it is on my bucket list. Nice Flag paint job by the way, well done. The monowheel stears by shifting your weight, Its not made to be practial just for the fun of building and becouse it can. Same with the mobillity scooter, to be real there is no practical use for a mobillity scooter that is able to do 120 mph on the 1/4 mile. It´s all just for fun. 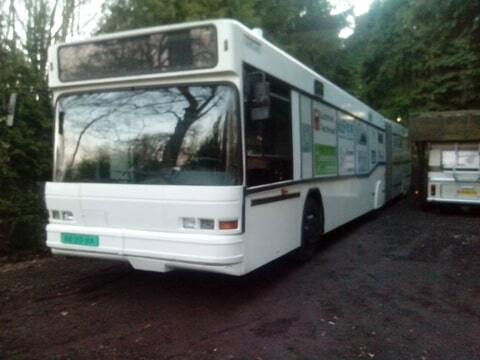 We need more space to transport our toy´s, so I got me this 58 ft buss. Yeah.... but the noise it makes goin' down the boulevard is 'gallon-gallon-gallon-gallon'. warmstrong1955 wrote: Yeah.... but the noise it makes goin' down the boulevard is 'gallon-gallon-gallon-gallon'. At the electric company where we did outdoor signage and traffc lights, we had a bucket truck one tonner with 454, and it was a pig. Only about 11-12 mpg. I changed it to a 350 open loop injection, and it pulled the truck as well and 17-18 mpg. Myself I picked up my 97 Ford 350 dual cab dually with the International 444E. After a cam change for a lube failure, and checking the chip that replaced the California smog chip, it got 24-26 mpg expressway and 19 around town with a 9k lb vehicle. it actually beats my 97 Ford Ranger 4.0 that is steady 19-21 mpg all around. My 02 Rescue Ranger that is moms driver, gets a steady 20 mpg, but it is a regular cab, and 3.0 engine. A lttle under my expectation, but it goes-goes-goes, with all the travel junk mom does. Car must be taken as the fuel content may be a bit diferent, as our diesel summer blend has a bit more wax in it , and winter blend is a bit hotter. Other variations may apply for regular gasoline, beyond the added Alchahol BS added here for the tree huggers. (I think its BS, but it is renewable, where crude is limited).